A one page portfolio for freelancers, programmers and designers. 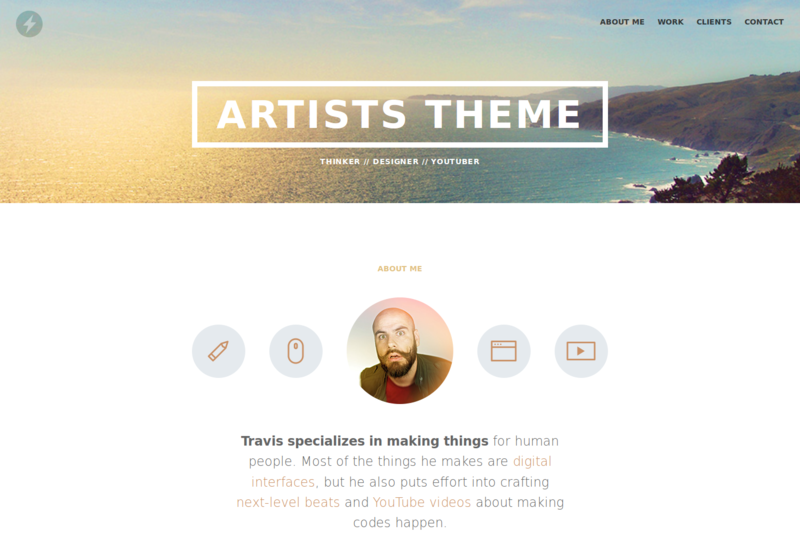 The Artists Theme is a one page portfolio for freelancers based on the original Jekyll theme by Travis Neilson aka DevTips and his many contributors. It’s the result of a longer video series made by him that is showing the whole developement process from the first designs to the final Jekyll theme. Consider to subscribe to his YouTube channel. This Hugo theme features several content sections, like an about section showing the level of your skills, a responsive portfolio with hover effects, a gallery to present your client’s opinions and a contact form. After installing the Artists Theme successfully it requires a just a few more steps to get your site finally running. The hero acts as an eye-catcher for your site. So consider to give him a nice background. You just need to replace the hero-bg.jpg at static/img with your own background image. But it’s important that you keep the original filename. Go to static/img and replace the logo.svg with your own file. If you don’t want to use an svg you also need to change the source name inside the all.css stylesheet here and here. In the next step, replace the image of Travis in the about section with one of yours. Therefore search the avatar.jpg under static/img. But keep the original filename here too. To rate your skill level, use a value between 0 and 10.
name = "TYPO International Design Talks"
The folder attribute defines a project-specific subfolder for your images. You will use it at the end of this section. Beside the data/work.toml, there is under content another subfolder called work which hosts the files that will appear as your projects in the work section. Copy the whole folder into the content directory at the root of your Hugo site. TYPO: International Design Talks is an annual event held in Berlin, London, and San Francisco. This promotional project is developed to market the event for the designindustry. The use of patterns, sophisticated color scheme and typography are applied for the print and mobile application. The paths to your images are relative to the base url. Store those under static/img/work/<folder>/. <folder> is a the attribute from the data/work.toml that you defined for the images above. Create at least a thumb.jpg for the preview in the portfolio grid. title  = "Director of Design, OnToText Ind." quote  = "**While we all felt that Travis was a great** asset to our team — and really worked hard to understand our products from the point of view of the customer — we also all agree he should shower more often." twitter, facebook, github, pinterest google-plus, linkedin youtube, instagram, dribbble, behance, soundcloud and vine. This theme is released under the Unlincense License. For more information read the License.